Lug Bags for Smart Travel | PC Fallon Co.
Lug bags are designed for life on the go! 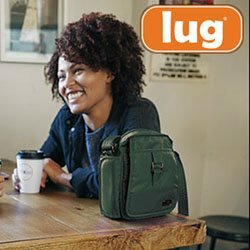 Lug products tackle everything from serious travel to everyday living with smart, stylish solutions to your active lifestyle. Gym bags, backpacks, totes, wallets, laptop cases, wheeled bags and much more, all in bright, brilliant color. Each piece focuses on functionality with unrivaled organizational features and Lug's signature fabric that's light as air and easy to clean. Padded compartments, hidden water bottle holders, removable coin pouches, pen holders and easily-accessed smart phone pockets are just a few of the features you'll find in these smart Lug products. P.C. Fallon Co. is proud to offer this great line and, as always, shipping is FREE on orders over $89!